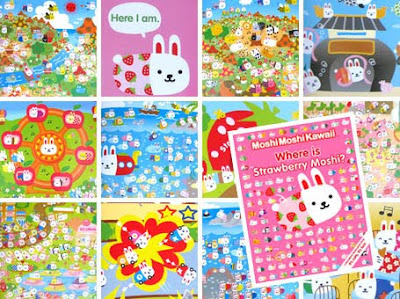 KawaiiPunk - Kawaii Mascot Blog: Moshi Moshi Kawaii books arrive in UK! What you are looking at is the first Moshi Moshi Kawaii book to be published in the UK, and it’s called Where is Strawberry Moshi? It follows the adventures of Strawberry Moshi as she searches for her elusive sweetheart, Super Moshi. And what a search it is! You’ll have to keep your eyes peeled and wits about you as you help Strawberry Moshi on her quest - travelling through the Mushroom Forest, swimming through the Mermaid Moshi Sea, and even navigating the yummy sounding Delicious-Land! How cute is that? But wait! Didn’t I promise you two books? Of course I did, and here it is! 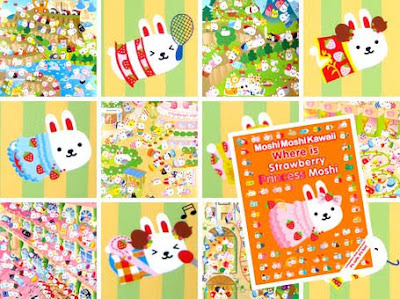 It’s the equally cute and fun Where is Strawberry Princess Moshi? In this book you’ll help Strawberry Moshi become Strawberry Princess Moshi by helping her and her friends find their way to the grand ball being held at Crown Prince Moshi’s castle. And, once again, you’ll have to keep your eyes wide open to do so! So do you think you’re up to this super kawaii challenge? Then why not head on over to Walker Books and give it a try?